I recently completed a really enjoyable commission for Harefield Hospital NHS Trust to celebrate their centenary. There’s a brief background on the project here. This quilt is inspired by a 1915 quilt made as a fundraiser for the first hospital on the site and the new quilt tells the story of Harefield Hospital since the First World War to the present day. Throughout June 2015, I worked with communities, staff, patients and volunteers to create this quilt full of details about the hospital. The quilt is made from traditional hexagon patchwork with over 400 individual pieces including the techniques of hand and machine embroidery, digital printing, screen printing and natural dyeing. The pieces are all hand sewn together and the quilt is hand tied. The pieces used in the quilt were made during a series of workshops at the hospital, starting with screen printing and natural dye to create patterned fabrics to use in the patches. We used plants from the hospital grounds to colour the cloth and images from the buildings and archives as screen prints. Later workshops included digital printing, embroidery and making the 400+ hexagons used in the finished quilt. Many of the patches are made from digitally-printed images using photographs from the hospital archives and photos I took of the grounds and buildings in Spring 2015. We have also used logos, plans, documents and photographs of recent events at the hospital. Blue and grey fabrics used in the quilt are old and current nurses uniforms from Harefield. Written quotes include oral history testimony from staff and patients, as well as comments from the hospital’s Facebook pages. Regular contributors have hand stitched their names onto patches and some contributors gave photographs of family members or documents which refer to their relationship to Harefield Hospital and to social activities related to the hospital. Hand stitched outlines of leaves refer to the wards named after trees growing in the grounds. We have also included details of the red and white ANZAC quilt and photographs of the ANZAC cemetery at Harefield Hospital. Rowan leaves to represent Rowan Ward. Hand embroidery. Detail from Harefield Hospital quilt commission, 2015. The quilt was entered into the Festival of Quilts open competition in August and will be on permanent display at Harefield Hospital from mid-September. I’m working on a completely new piece at the moment, for a pop-up gallery in Leicester called The Salon. EC Arts have been commissioned to fill the old salon with art by local and regional artists inspired by the local area, ideas of beauty and consumerism. With it being a salon, I chose to work with hair, inspired by Victorian mourning jewellery made from a loved-one’s hair. I’ve wanted to do this for a long time and this was the perfect opportunity. You can see some of my research images on Pinterest. 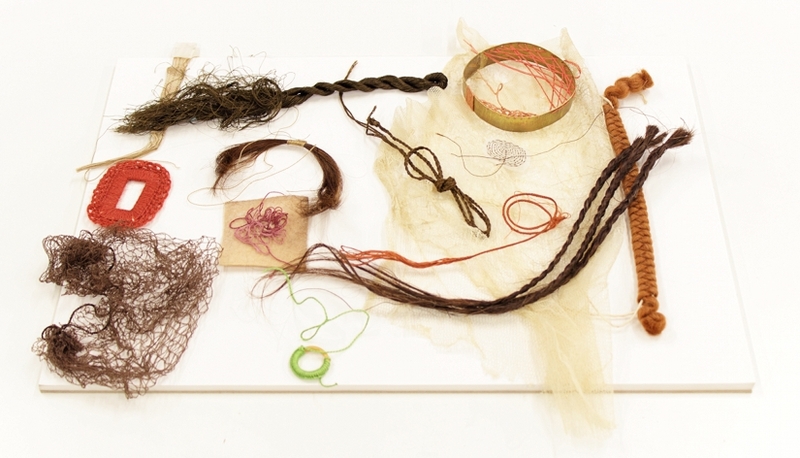 I am using real hair (from mannequins left at the Salon) and have been exploring weaving, plaiting and braiding, combining the hair with silk and using textile frames to display small elements I have made. 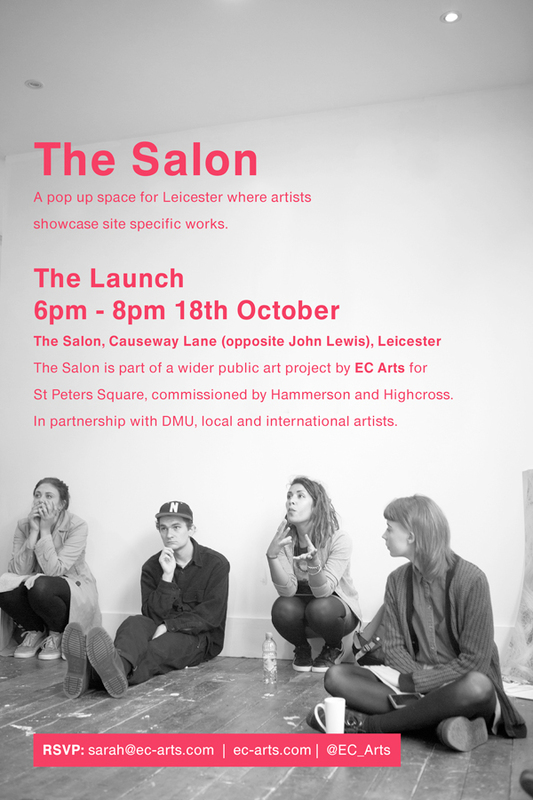 The Salon gallery launches on Friday 18th October, 6-8pm. It is Next to Next, opposite John Lewis, in Leicester’s Highcross shopping centre. The exhibition continues until Saturday 26th October.